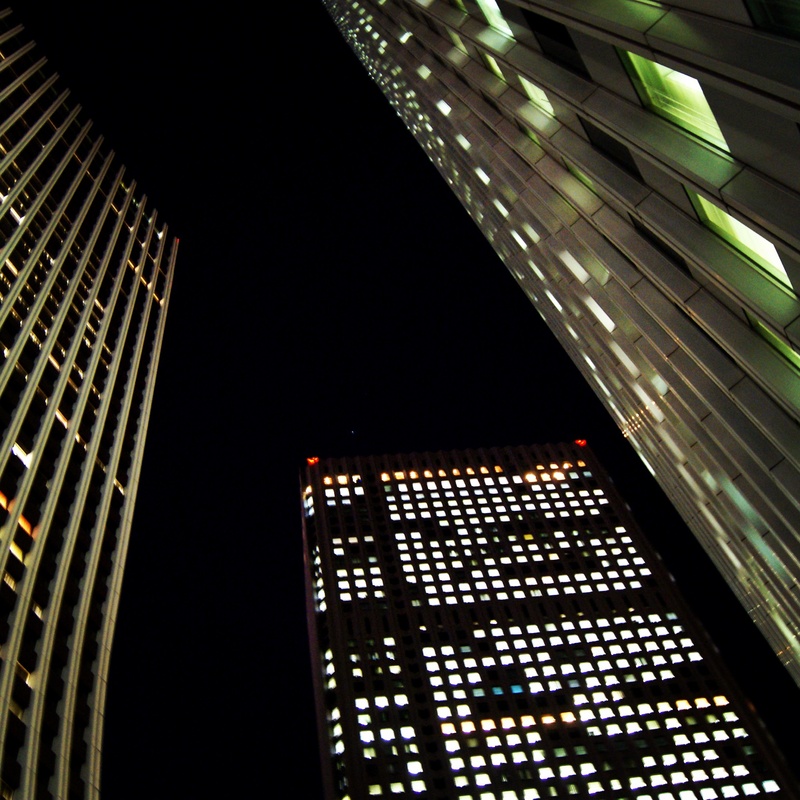 Walking in the darker part of Shinjuku. Tokyo, or should I say it’s entertainment district Kabukicho really lives up to it’s nickname Sleepless Town. I got out of bed last night to get something to drink and glanced out of the window. It was almost 5am and across the street on the eighth floor was a woman sitting in a chair getting her hair styled! Who on earth goes to the hairdressers at 5am, or even more importantly where else would you find hairdressers even open at that time? The street ten floors below was filled with cars stuck in a traffic jam, drunk people staggering along the street, someone lay unconscious in a doorway and what’s even more compelling it was only a Monday night. Even the birds in Kabukicho don’t have a chance to sleep as here the sky never gets dark, the blaze of neon lights up the sky, the land of the never fading sun. It was around noon when our Lost in Translation drama started. One thing that is very odd about this mega metropolis on level with London and New York is that unlike those cities you can’t even get a sandwich to eat. 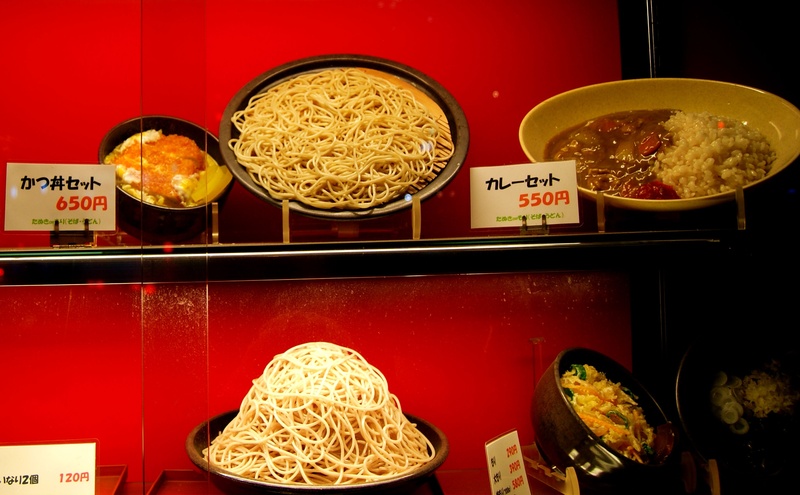 All the food displays in the windows are just plates of rice or noodles with a bit of meat on top. We also noticed on many dishes they just can’t resist adding the piece de resistance, a shrivelled shrimp, which became an in-joke between my boyfriend and I “…look over there, there’s another shrimp!!!”. My heart sank as this was nothing but bad news for me. I went to restaurant after restaurant pointing to the menu and saying in Japanese “i’m a vegetarian” and they would always apologize and say they weren’t a vegetarian restaurant. This was so frustrating because I was asking them if they have any vegetarian dishes and everytime they assumed I was asking if they were a restaurant for vegetarians. How more lost in translation can it get? My patience cracked when someone produced a map and drew a circle on the other side of Tokyo and told me there was one vegetarian restaurant there. Eventually we found a buffet place. They had margherita pizza but the rest of the dishes had meat or more argh!…..shrimps. More madness in the buffet place you could only get one slice of pizza at a time. I burst out laughing when my boyfriend took the whole pizza section out of the buffet area and we had the whole pizza to ourselves. Some Japanese people were glancing over but who cares, if you don’t get it and refuse to become a world metropolis catering to foreigners then food terrorism like this will continue! I’m not asking for much, just a ciabatta mozarella pesto and a cup of tea… Spot the shrimp!! After lunch we met an old Japanese friend who we knew from Amsterdam. I was excited, now was our chance to slip below the surface of Tokyo into the hidden world of Japan which few foreigners would ever see. He took us through the streets of Kabukicho to…….an Irish bar? I knew he thought we might be dazed by Japan and decided to take us somewhere familiar but we didn’t travel across eight time zones to go Irish. After drinks we said our goodbyes and decided to go it alone, we were tired of being lost in translation. 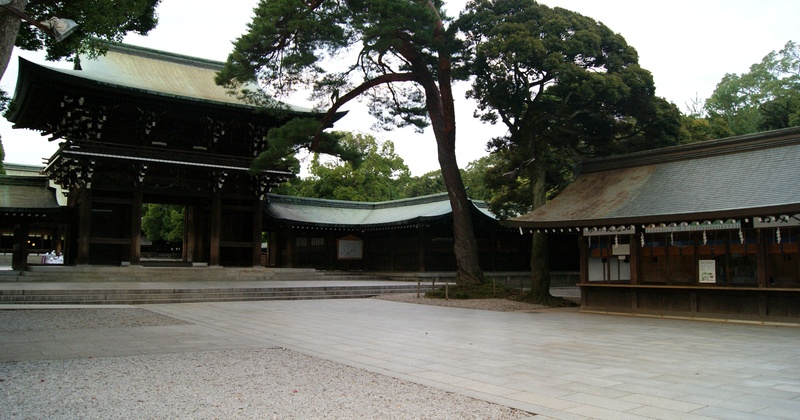 Meiji Jingu In Yoyogi Park…all to ourselves! We just wandered through Shinjuku feeling completely isolated as if we were aliens peering into a strange abstract world. We made our way towards Shibuya and through evergreen Yoyogi Park and as I noticed mosquito bites on my arm I tried to work out if it was this park or another park that was experiencing the dengue fever outbreak. We noticed two massive torii gates and walked through the trees until at dusk we came to Meiji Shrine, one of the most famous shrines in Tokyo. I guess we got there at the right time as it was almost deserted, just they way I want holy places. It was really nice but in the back of my mind I wasn’t as impressed as seeing the temples in India or S.E. 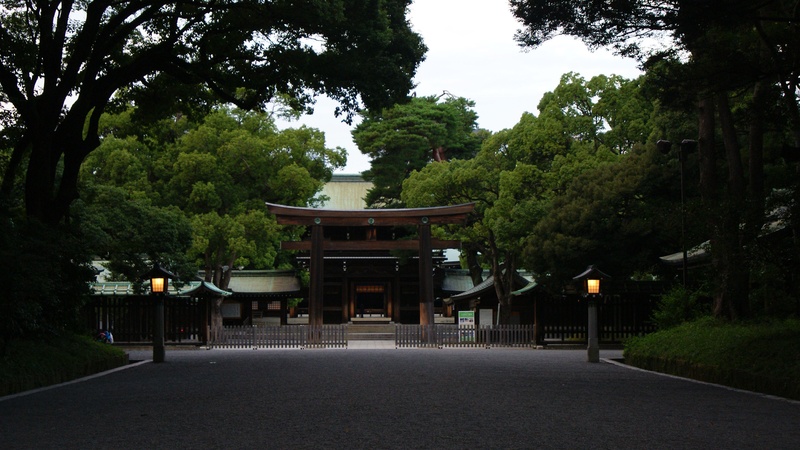 Asia, after all Meiji Jingu was built in 1913 then rebuilt in concrete post WWII. What impresses me the most is the date of iconic structures, the older the better. 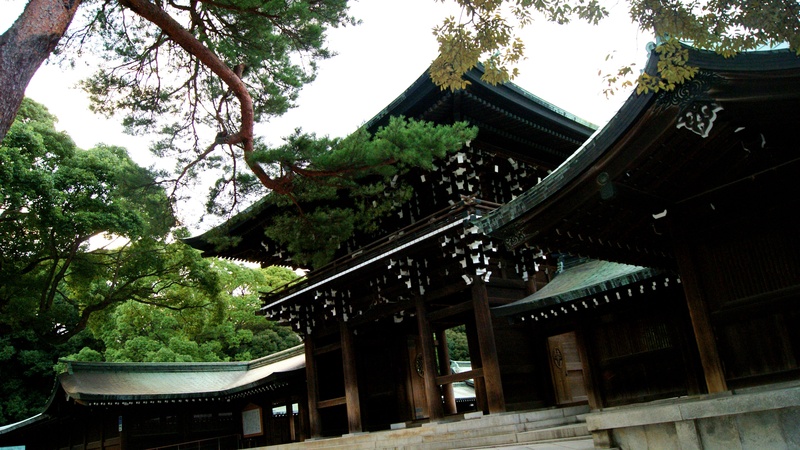 Even though the shrine is precious to the Japanese people it is still an infant within the greater picture. Back in Shinjuku what I imagine were fortune sellers set up little lonely stalls lit by candle. On a street corner was a tall, skinny transvestite with auburn cropped hair wobbling about on a pair of 12 inch high heels while handing out flyers. A foreign couple, maybe European or Australian started snogging at traffic lights which caused a commotion Japanese style, i.e. quiet, expressionless, side glances. Illuminated trucks with huge billboards drove past advertising scantily clad girls. All the while the most suffocating, crushing feeling of impersonal formality pervaded to a backdrop of mass consumerism. A man in a uniform rushed over with a little silver tin and told my boyfriend to extinguish his cigarette in it and pointed along the street to a designated smoking zone. How ironic is that, a place where every restaurant is full of toxic cigarette smoke and you can’t smoke outside? Anyway, even though we’ve just gone through one of the most ironic days of our lives I think i’m going to like Japan. It’s not like India or Iran where curious people rush over and invite you to their homes or just want to talk in general. The Japanese are not accessible and this could ruin my stay in this country, only time will tell. This entry was posted in Japan and tagged Japan, Japanese, Japanese cuisine, Kabukicho, Meiji jingu, Shinjuku, Tokyo, Vegetarian in japan, vegetarian restaurant, Yoyogi park. Bookmark the permalink.